Scenes like this were far too common last winter along I-70 in Colorado. Lawmakers are debating how best to deal with the situation (I-70 Coalition photo). 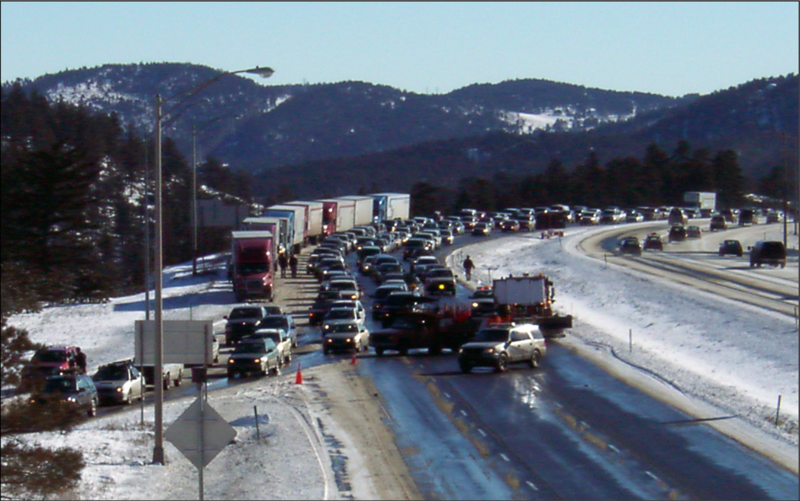 Democrat Diane Mitsch Bush, who represents Vail and surrounding Eagle County in the State House, told Government Executive State & Local she’s weighing a bill to address vehicle traction along Interstate 70 to avoid prolonged winter closures between Vail and Denver. A former Routt County commissioner, Mitsch Bush is running for reelection against retired businessman Chuck McConnell, a Republican who also lives in Routt County. The I-70 debate, after a series of high-profile incidents last winter that ballooned two-hour drive times to nearly nine hours, has increasingly become political. A variety of politicians seeking different offices in November weighed in at a local meeting last week of the Colorado Lodging and Hotel Association, including Mitsch Bush and Republican nominee for governor Bob Beauprez. Campaign representatives for Beauprez did not return phone calls and emails requesting comment last week. A spokeswoman for Colorado Gov. John Hickenlooper said the state’s focus for now is on reducing truck traffic during peak ski season. The governor discussed an outright ban of commercial trucking during peak ski periods while campaigning in 2010. Hickenlooper spokeswoman Kathy Green said the state has implemented a variety of tactics that helped reduce commercial truck traffic during peak ski periods by 10 percent and will continue to work on the issue. Phil Amderle, real-time traffic and incident manager for the Colorado Department of Transportation (CDOT), said a number of different tactics will be in play this winter, including increased courtesy patrols and metering of traffic to avoid too many vehicles approaching the Eisenhower Tunnel, jamming up and sliding out in adverse conditions. Another big step will be a full-time traffic coordinator CDOT is hiring for the critical 100-mile stretch of interstate. Vail Mayor Andy Daly was traveling and therefore unable to attend last week’s lodging community meeting in Avon, but he said the issue is still front of mind for him. That statement looks especially prescient in the wake of Vail Resorts’ acquisition last week of Park City Mountain Resort in Utah, where the ski slopes are a mere 35 to 40 minutes away from Salt Lake City International Airport on I-80. Some Colorado stakeholders are pointing to I-80 in California, where Donner Pass is sometimes closed to truck traffic, as an example of what Colorado should be considering. But Greg Fulton, president of the Colorado Motor Carrier’s Association, says Donner Pass is very different than I-70 between Denver and Vail, which has so many different potential bottlenecks. Fulton argues that with reduced commercial truck traffic during peak ski season driving periods semi-tractor trailers are a very small part of the problem. Truckers, he says, already face the stiffest fines in the country for not carrying chains when the chain law is in effect. Now, he adds, it’s time to start looking at unchained private vehicles. Fulton says limiting truck traffic could have vast national economic repercussions by raising the cost of goods transported along the vital east-west corridor, but ski industry officials are equally concerned about impacts to their $2 billion annual industry.